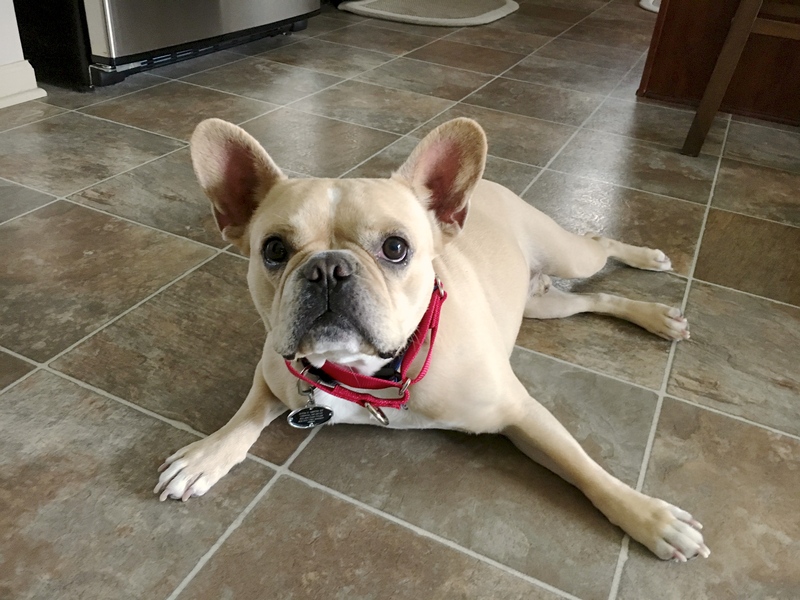 Phil is a four-and-a-half-year-old French Bulldog who lives in Omaha. Phil’s guardians reached out to us for some dog behavior help to stop his anxiety and stop him from chasing light reflections and laser beams. Phil was away from the door when I stepped inside which was unusual for him. I simulated a knock on the door and within seconds he was there. He jumped up once, but after a light correction he stopped trying to jump up. Phil showed good confidence and very polite behavior for the rest of the greeting. I did notice he started to get excited when I reached to pet him so I adopted a pausing technique that he responded to really well. You can watch it in the last quarter of the greeting video I shot by clicking below. Many people confuse excitement for happiness when it comes to dogs. But excited is an unbalanced state of mind. Just like humans, dogs are not at their best when in an unbalanced state. Additionally dogs who get over excited can get into other behavior issues which is why I showed his guardians the petting-pause technique in the video above. I shared a number of dog training tips and dog behavior secrets with his guardians while we discussed his issues and how I could help them with their dog problems. Adding rules and structure and petting Phil for desired actions and behaviors will go a long ways towards improving his respect for their leadership. Phil was spunky at times (in a joyful way), and really has a great, warm, playful energy. He was able to listen and take corrections well and was responding to the various techniques I walked his guardians though. To address Phil’s desire to chase lights and later beams, I pulled out some high value treats to see if we would use a combination of desensitization and counterconditioning. Phil is responsive to different types of light; he chases reflections off the fridge, off a cell phone and even light passing through the blinds. Obviously he also chases lasers. I suggested his guardians journal the times that some of these reflections occur in their home so that they can schedule time to practice the technique when the light reflections happen naturally. By the end of the session, Phil was able to sit calmly even when we moved the laser light a few feet of him. Now its going to take consistent practice form his guardians before he no longer chases lights, but based on how well he did in this session, Im guessing it wont take long.